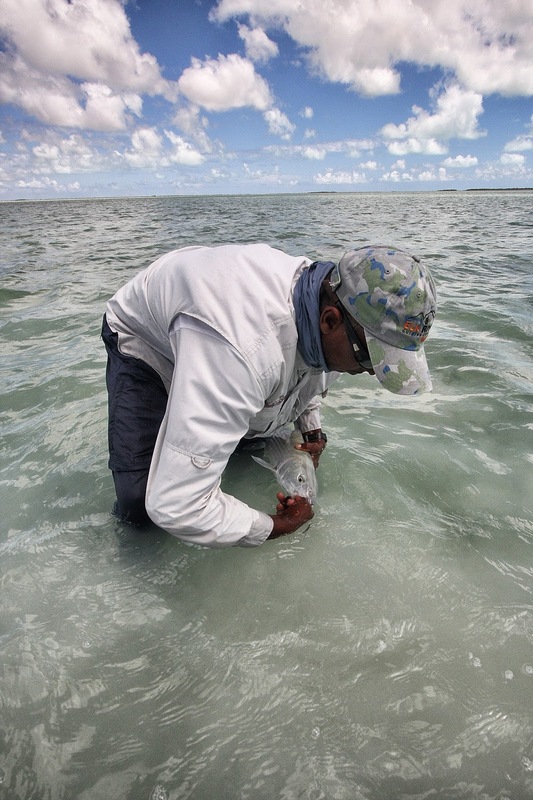 The last two days were a pure joy… and why not… our home rocked gently in electric blue waters at one of the most remote anchorages in the Bahamas, we were fishing flats rarely visited and our weather, although windy, was sunny and clear. The only "less than perfect" moments happened when were we headed north to reach the flats. In doing so, we had to round (at Salina Point) a long exposed shore. With the strong 20 mph winds, the heavy chop slammed the skiffs diabolically. To avoid being totally drenched, we donned raincoats and pulled our hoods tight. Going home wasn't so bad as we were running with the waves. 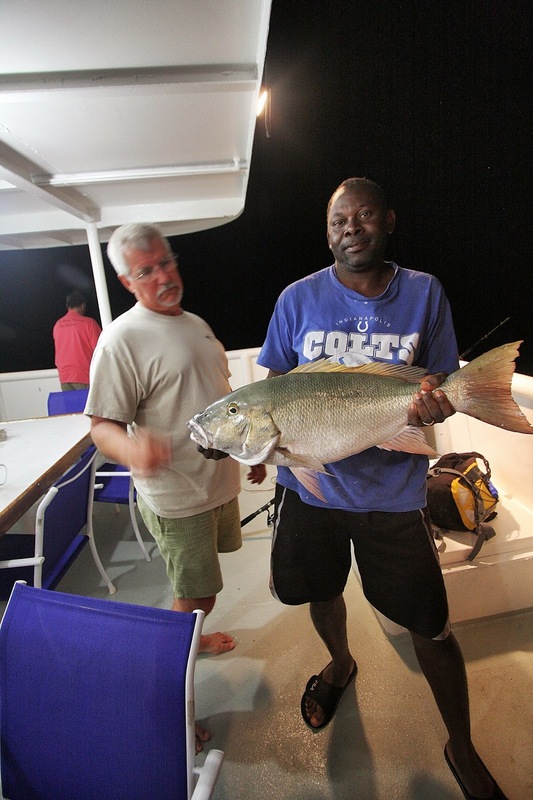 On Thursday (Day 5) I fished with our guide Reno, Steve Peskoe and "EZ" (Earl Zagrodnik). 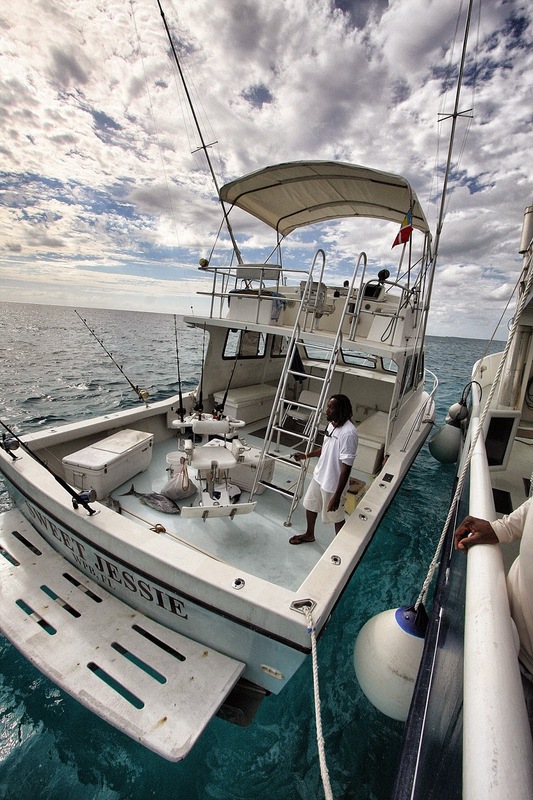 We fished Roker Bay and the flats north of Roker Cay. I hadn't fished these flats since I was on the Commander liveaboard with Dave Sloan at the helm fifteen years ago. I remember beautiful creeks, large firm flats and lots of hefty bones. Not much had changed. As usual, I bailed out of the skiff early so Steve and EZ could fish with Reno. I began my day on a large hard-bottomed flat that was fed by a picture perfect creek. 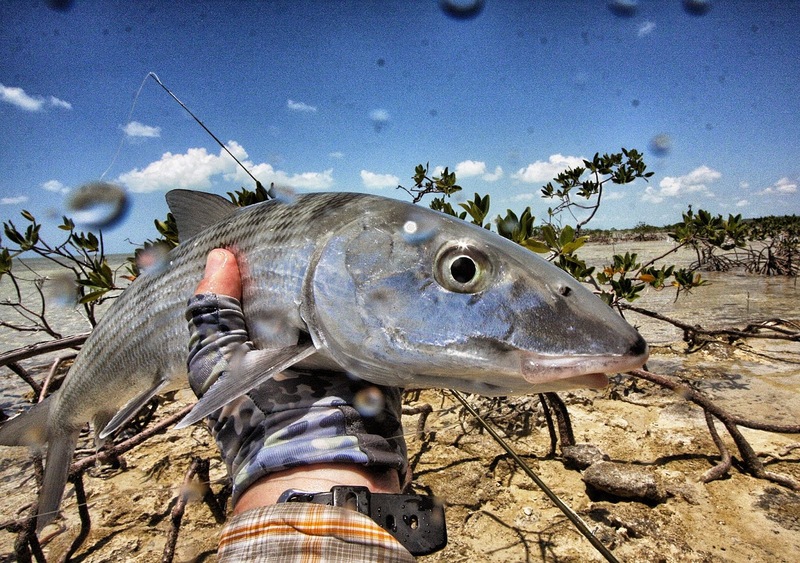 White sand beaches, palms leaning out over the sand and a perfect bonefish habitat had me convinced I was on the verge of a "boneanza"! I ended up taking a long hike thru this creek system that looked like bonefish central, but to no avail. The cries overhead from an osprey supported my assessment, but both of us were not getting the results we expected. And if my osprey couldn't spot any bones, how the hell did I have a chance! 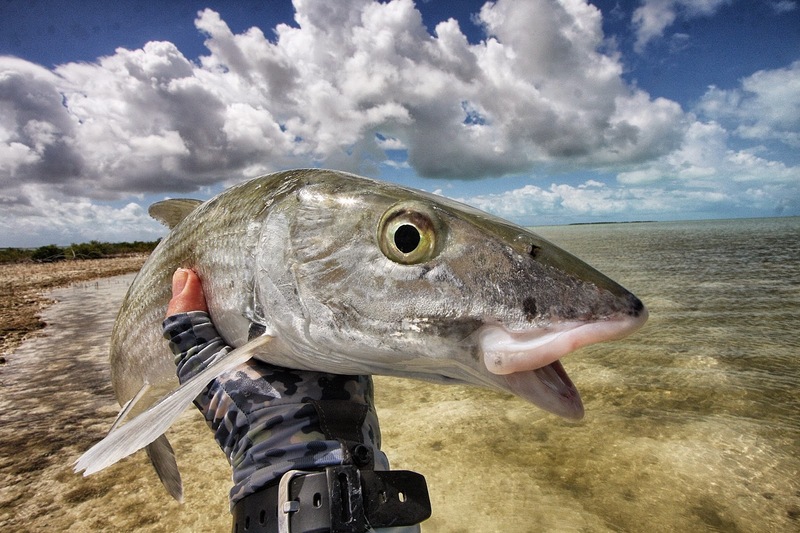 After walking out the other side of the creek having seen exactly zero (as in zip, nada), I waded back along the ocean side and by the time I got back to where I had started, I had covered many miles, seen no fish and was totally baffled. The creek, the outside shore and the flat outside the creek were beautiful... there should have been fish everywhere. I did notice the water temp was unusually cold, especially for May, but it wasn't THAT cold. Anyway, by the time I had finished my big circle and gotten back to the flat where I had first bailed out of the skiff, Steve, Reno and EZ had pulled up in the skiff and were now wading towards the creek mouth. I waded towards them and almost immediately a bone swam by. WHAT the hell? I had made this big hike and now I see a bone right where I had started. 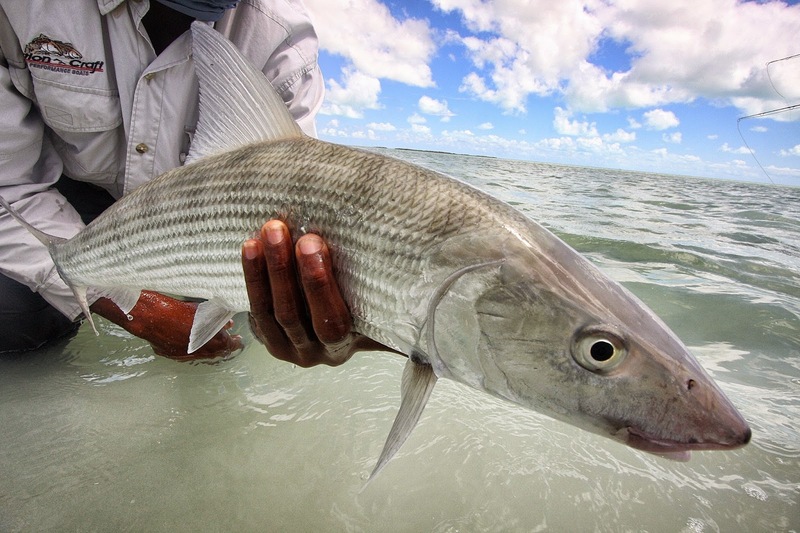 Then another bonefish swam by, then a small school, then it was like someone had flipped a switch and pegged the dial at 10. It was kinda weird! There were fish everywhere and over my left shoulder the osprey was holding still in the wind. He must have been amazed too. We both were just gawking, waiting for an opportunity to strike. We all caught a bunch of bones, then the spigot was turned and things slowed way down. Reno suggested we head to another creek. It too was gorgeous. The bones were less plentiful, but we still caught fish and some were in impossibly shallow water. I love hooking these shallow water, backs-out-of-the-water bones. The rooster tail kicked up on their first run is thrilling. 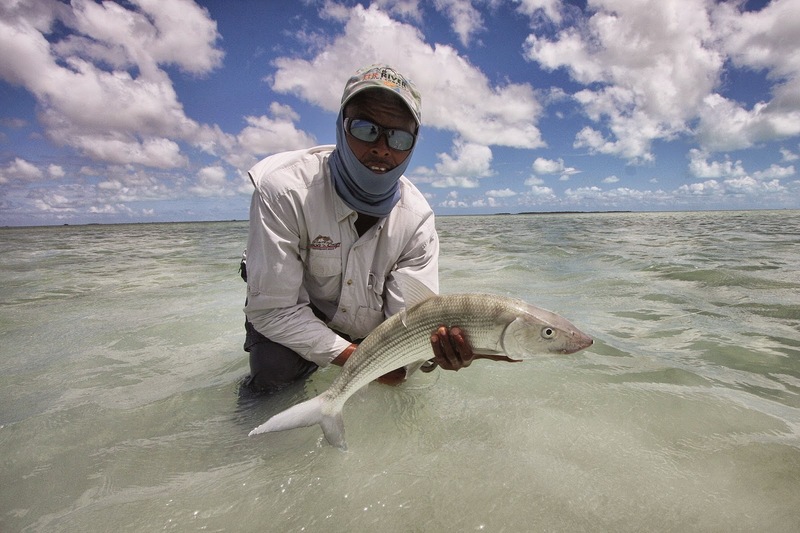 It's amazing a bonefish can be so fast with at times a third of their body out of the water. 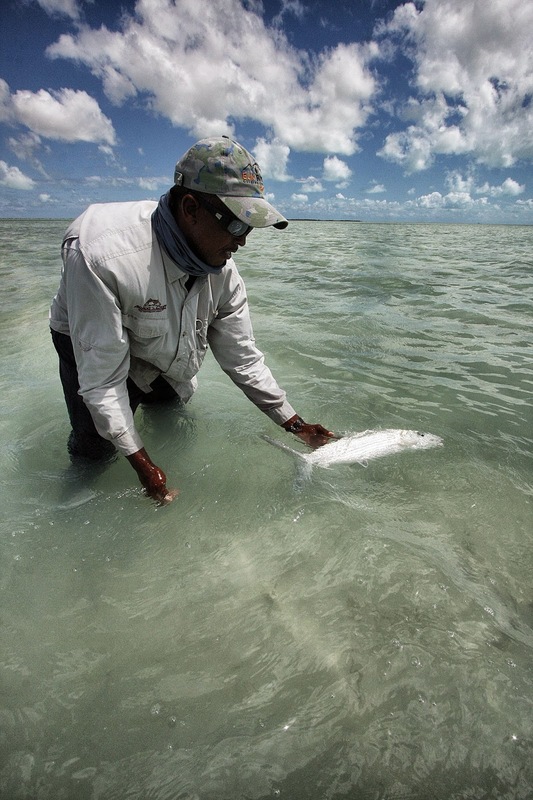 Eventually, I crossed from the creek to the ocean side and hooked a huge barracuda on my walk back to the skiff. The big 'cuda's take was frighteningly violent (it seemed especially so when you are standing in waist deep water 15 yards away). 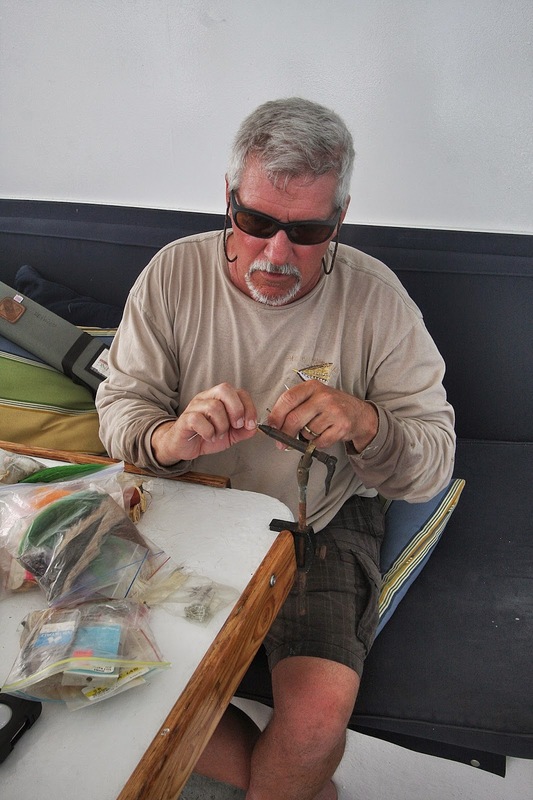 This barracuda was so big he eventually sawed through my 40 lb.Tyger wire tippet. Even that was perfect… I didn't want to handle this monster anyway! 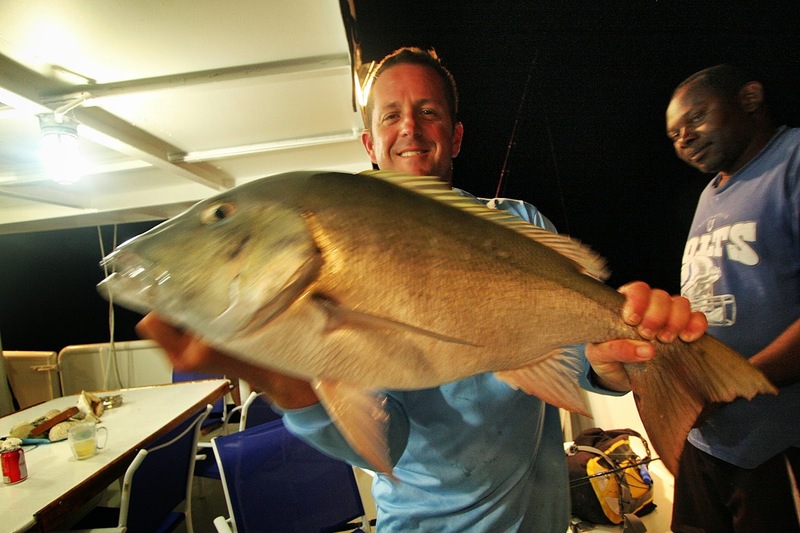 A big mutton snapper… delicious! 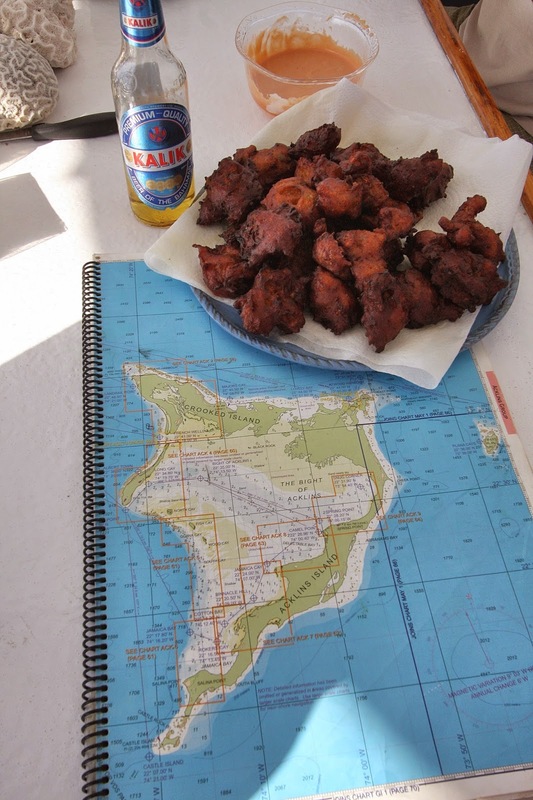 In the late afternoon, we returned to the Sea Hunter to enjoy conch fritters and a superb dinner of Jambalaya. 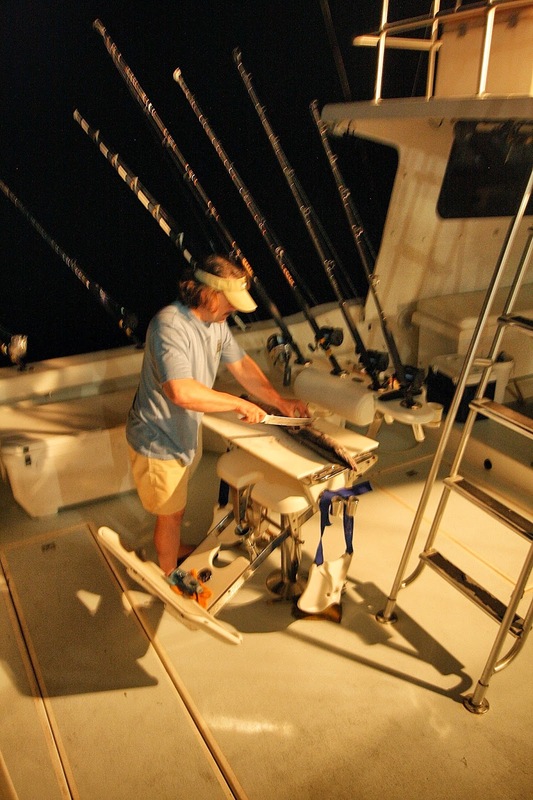 After dinner, we fished off the back of the Sea Hunter with fly rods and spin gear. 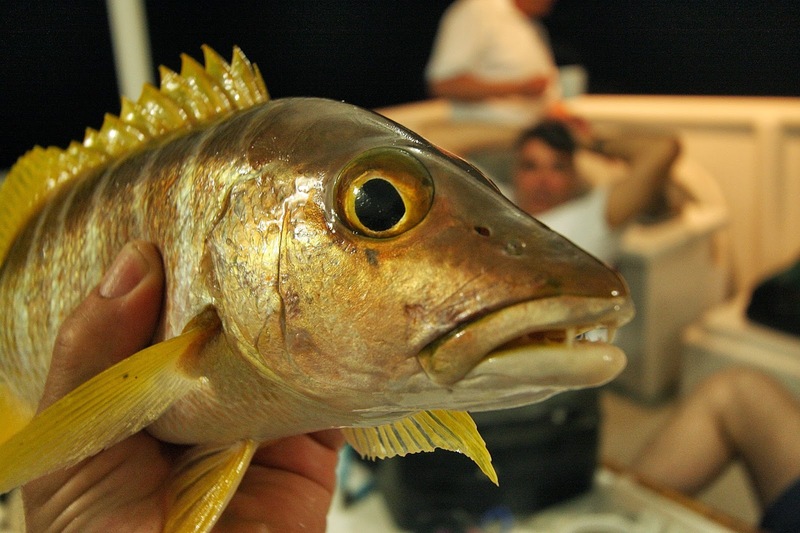 A pack of big-eyed jacks were camped under the boat. We hooked many and only landed a few. We chummed them up with rice left over from supper. A fly dangled in the midst of these leftovers was immediately scarfed up… at least for awhile, but then being jacks, they wised up. 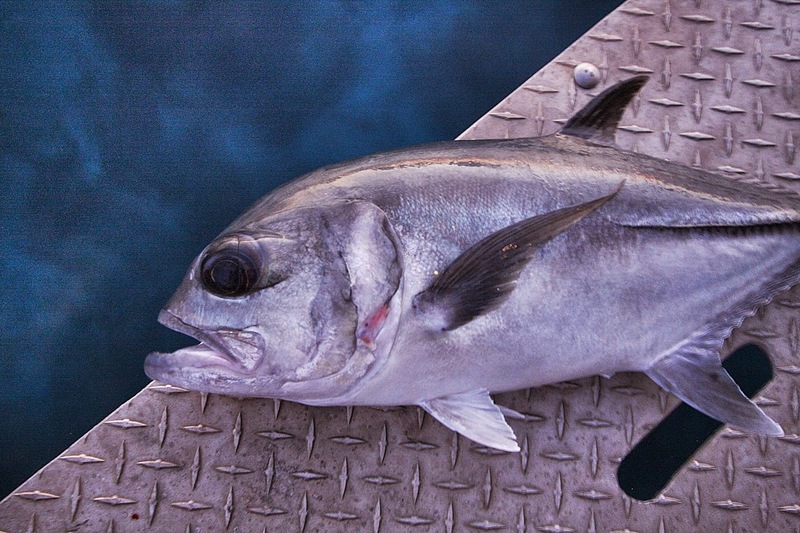 Most of the big-eyed jacks we hooked either reached the coral below or eventually sawed off on the ship's hull. 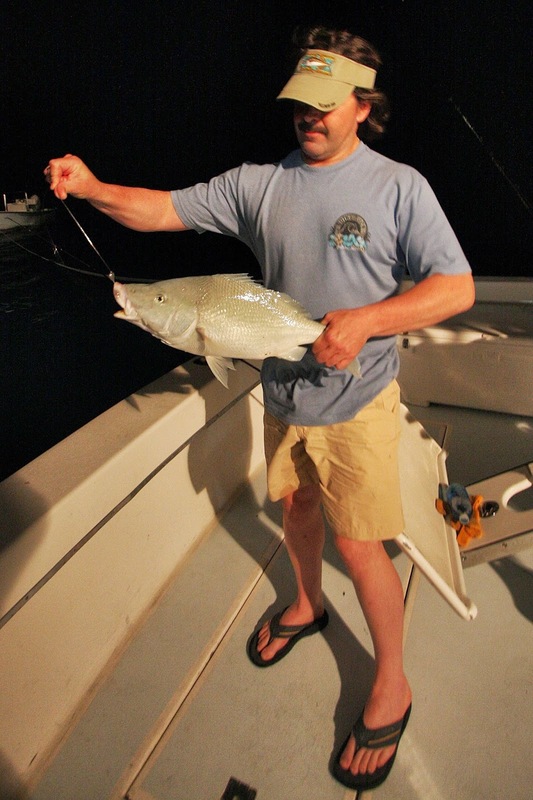 We also hooked a number of big mutton snapper, but only Doug Jeffries landed one of the big ones. 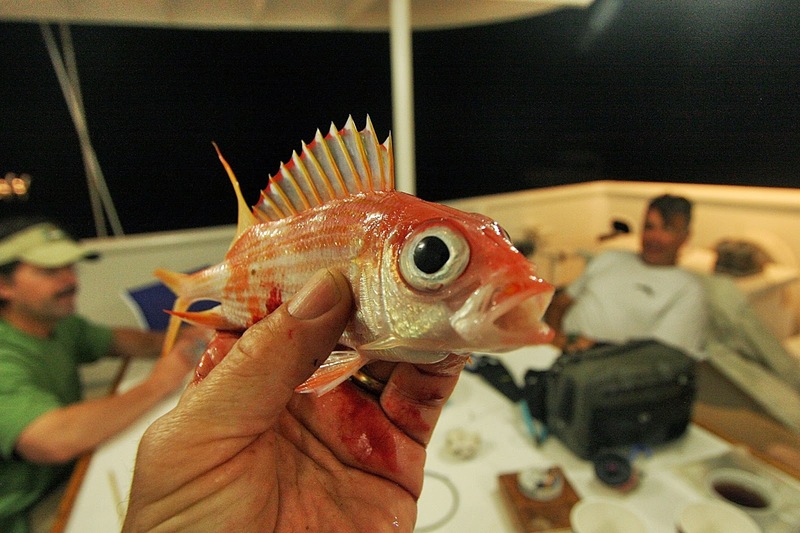 This fish was destined to become snapper fingers the next night. 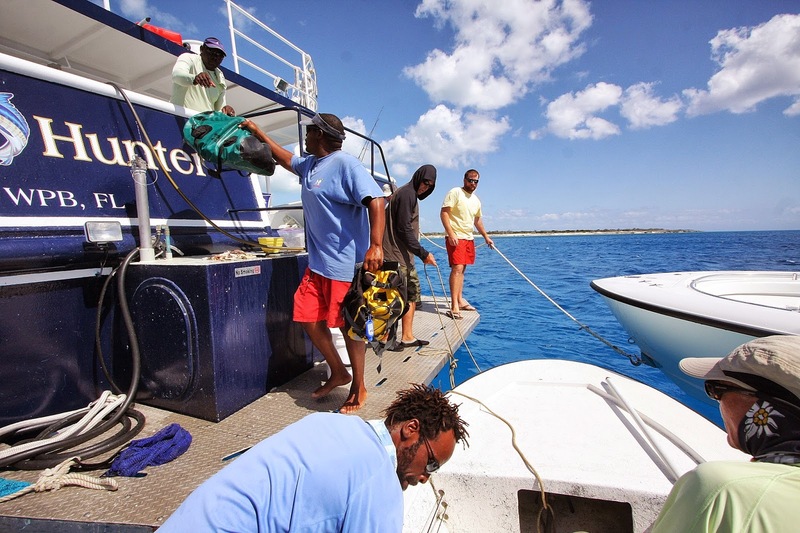 In addition, we caught numerous other snappers and reef fish. It was a lot of fun. 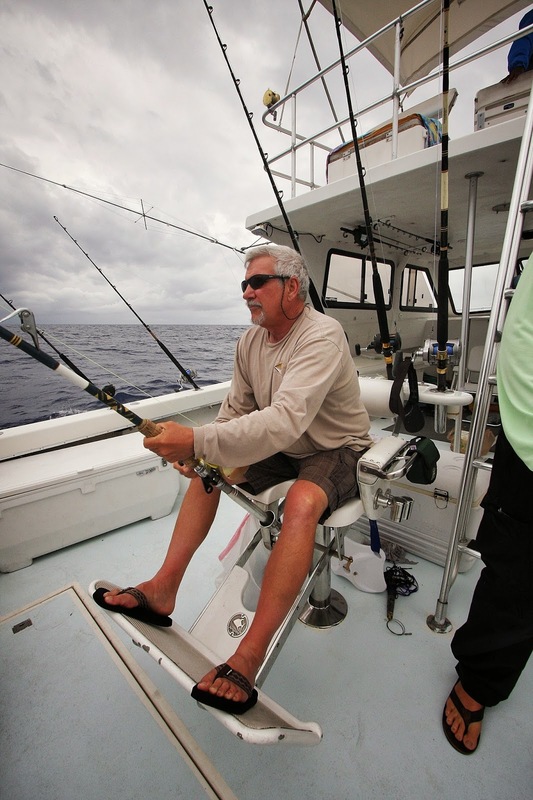 Day 5 was a great day… we all crashed early... pretty well exhausted from our long fishing day. Let's see if you are paying attention! For me, it was the perfect day. In the morning, we walked and walked and walked, but saw no fish. 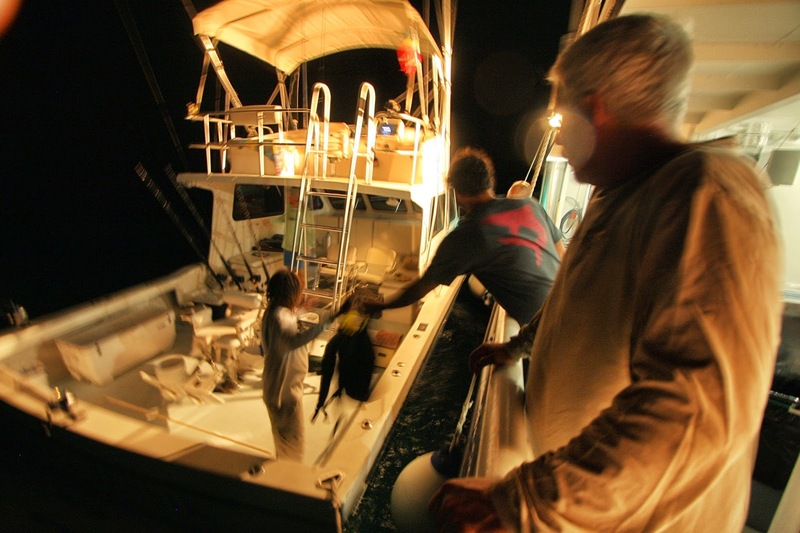 Then Fidel, who was getting a bit frustrated, took us back to our starting point and we moved the boat a mere 200 yards. As if on cue, a few schools showed up. 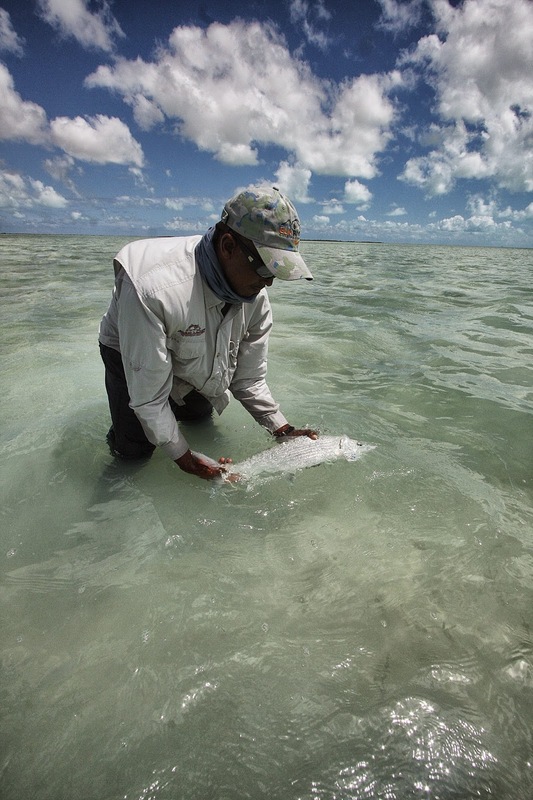 Jim Woollett, Steve Peskoe and I each hooked up numerous times, but Fidel wondered where the bulk of the fish were? Fidel muttered and fretted again, then signaled us to jump in the skiff. We quickly motored to a long shallow shoreline not far away. It was a good call! This shore offered a classic and quite beautiful flat. 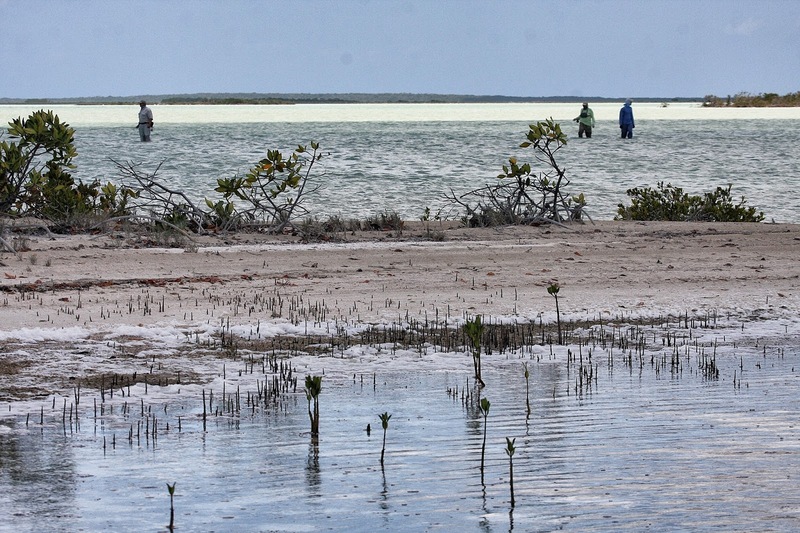 When the tide got high enough, it would flood onto a hard pan of packed sand dotted with small mangroves bushes. 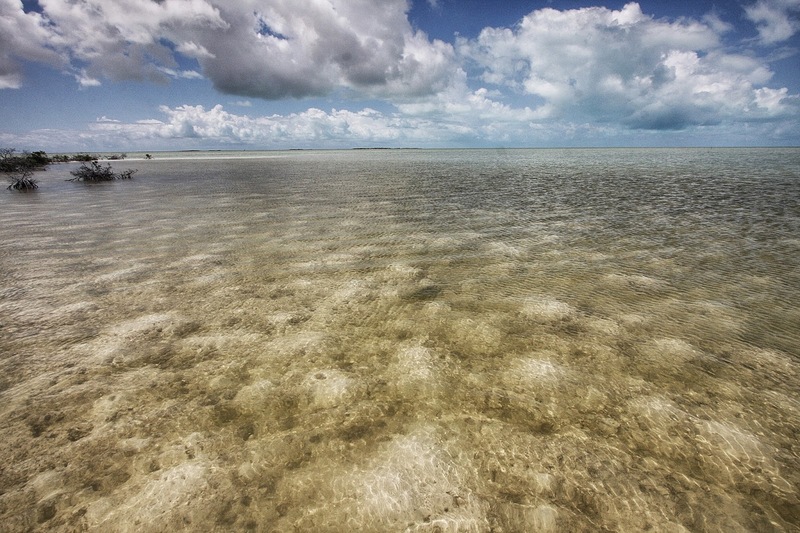 At this tide level though, there was water only in a basin below this hard pan and from the moment we got out of the boat, bonefish were following the pan's edge. No doubt this pan was their landmark. Big schools, small schools, groups of 5, 6, 8… pick a number, streamed by. It was like a bunch of high school cliques headed for the cafeteria at lunchtime. It was nonstop and thrilling. Sharks were everywhere and they were very aggressive. 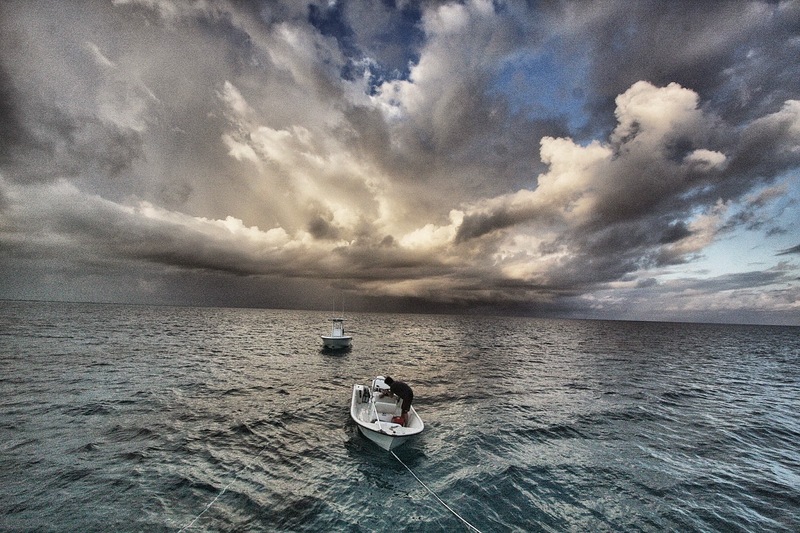 Every bone I caught was chased by a shark, some were eaten. 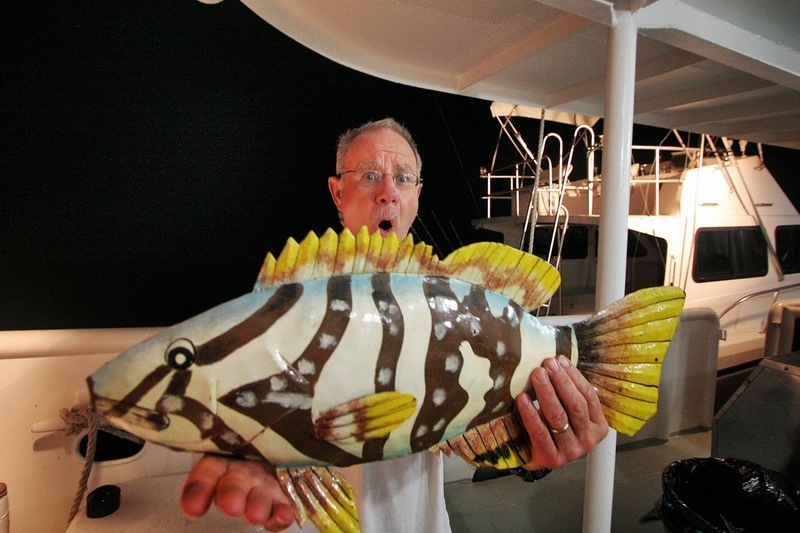 Soon, I waded out of the water, left these fish to Jim and Steve and hiked 500 yards away. When I stopped, I caught six or seven solid bones usually from the dry hard pan while I was hiding behind a bush. 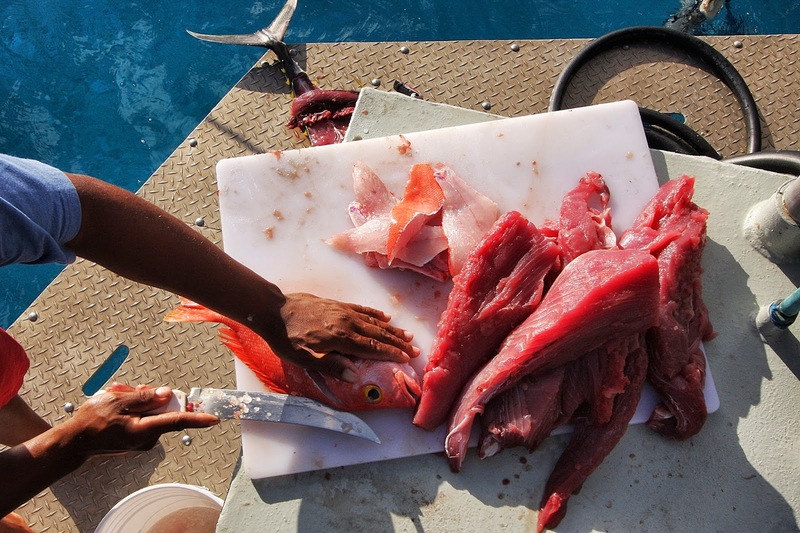 I hauled these fish out onto the hardpan when caught, chased off the sharks that were circling and quickly released these bones so they could swim another day. Most of these bones were caught literally within inches of the shoreline. At one point, I cast to a school of four and hooked a fish, but the hook pulled. These fish were moving fast contouring the shoreline so I crossed a point, caught up to the quartet and actually hooked another in the group. Perfect! 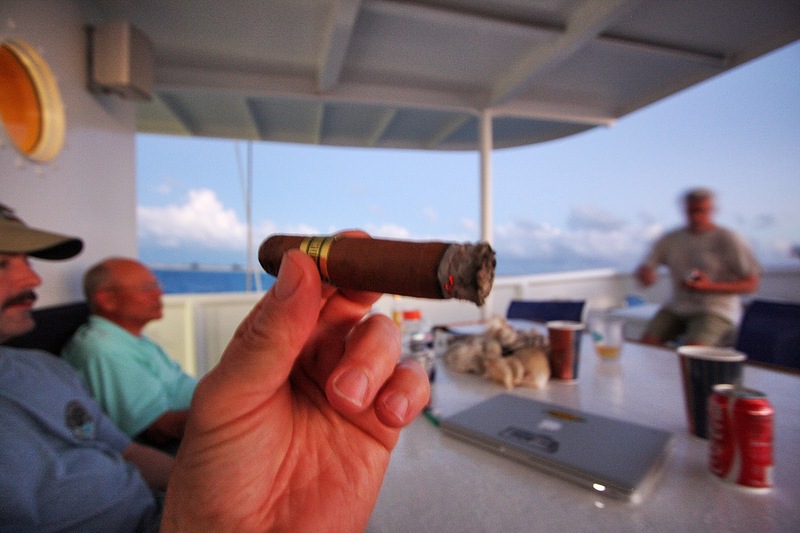 Eventually, Fidel caught up to me with the boat. Steve and Jim were with him. They had experienced great non-stop action too including a double. Now that's they way you end a trip! 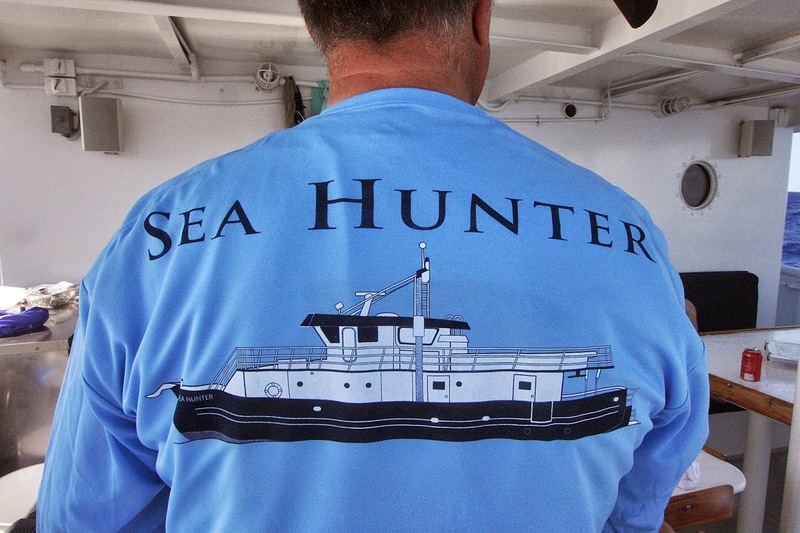 We motored back to the Sea Hunter, washed the salt from our rods, and before we could break them down and pack them away, we were underway, rumbling back to Landrail Point. It would take us a bit over 5 hours. We anchored in the dark with the lights of the village in the distance… the perfect end to a great trip! Soon, it was back to the airport to begin the journey home. This was a tale of two very different days! Day 3, Tuesday, was wonderful! Day 4, not so much… in fact, other than the company, Wednesday sucked. 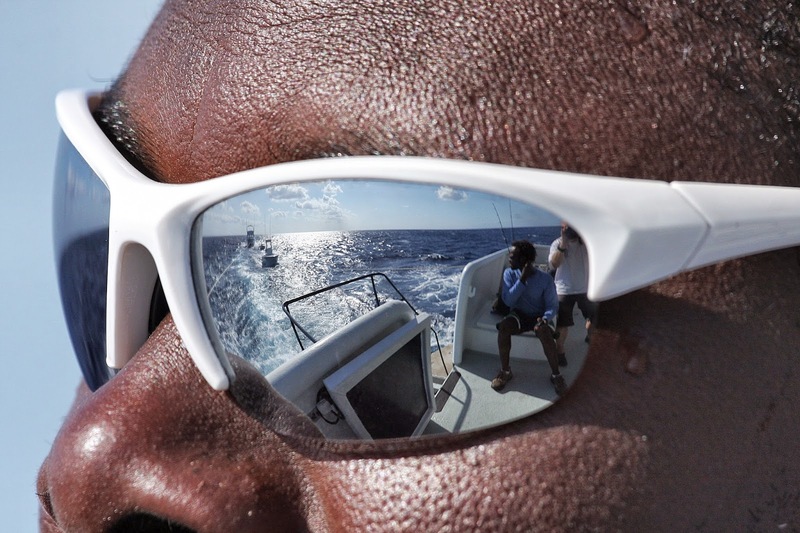 So let's talk about Tuesday… out third fishing day aboard the Sea Hunter. On this day, the relatively calm conditions that had been rolling in from the west and had made our bluewater day so relaxing swung to the northeast bringing a brisk 20 mph wind with it. Despite the wind, our day turned out to be superb! I started my day wading a softly curving bay. 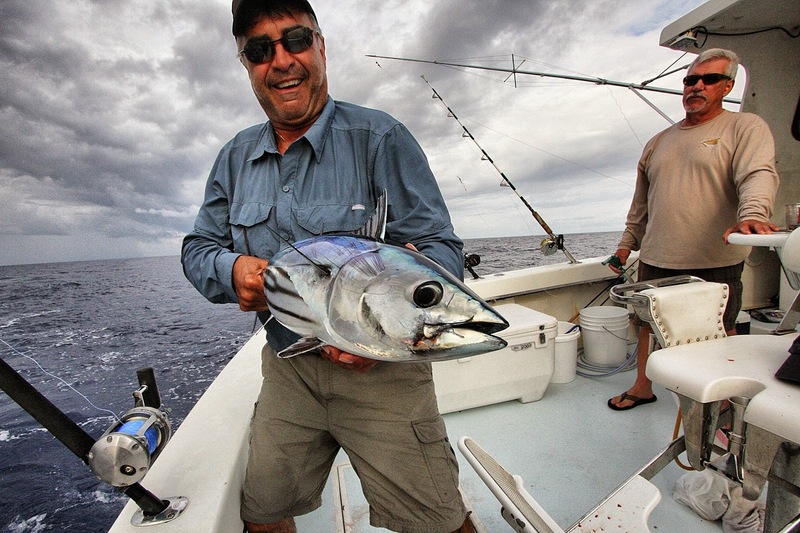 Guide and old friend, Kenny Scavella, had dropped me off and I had waded to shore at a nondescript point. This bay, which arched west, was all in the lee of the NE wind. After dropping me off, Kenny took off with Jim Woollet and Mike Kotrick headed for the next point where I planned to meet them. With these winds from the northeast, I had been searching for a lee shore hopefully with a creek on the downside and a big flat at the outlet to the creek. 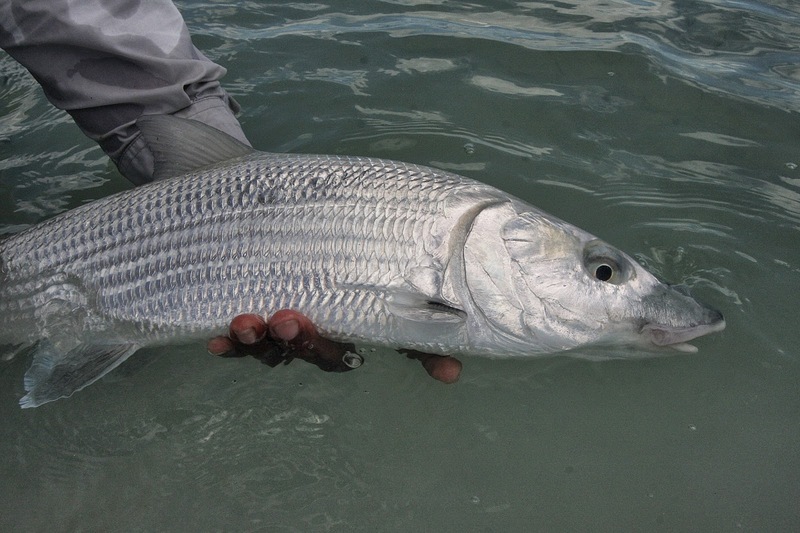 If we could find it, this would be a classic bonefish spot in these brisk winds. When I saw this point I thought it might work. I didn't know whether we would find the appropriate creek and flat on the downside. 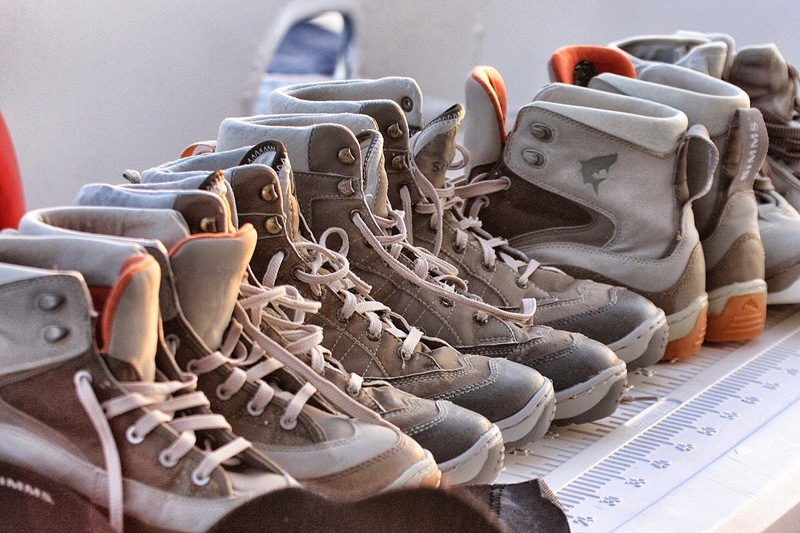 But it sure felt right, so I swung my legs over the skiff's gunnels and waded ashore. OK, so how good was my day? 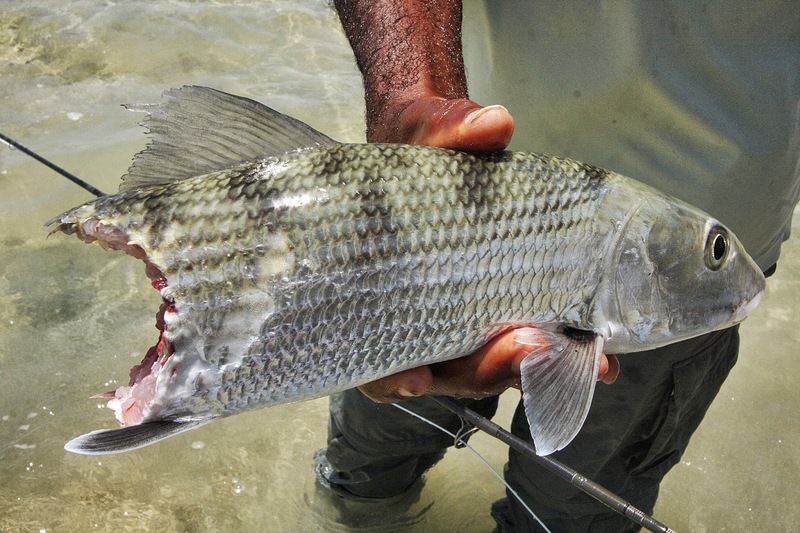 As soon as I had waded to shore from where Kenny had dropped me off, I saw a big bonefish happily meandering in and out of some mangrove shoots near shore. Kenny's Action Craft skiff was still idling into deeper water when I made my cast. I flipped my fly to the bone from my hiding place behind a bit of drift wood. 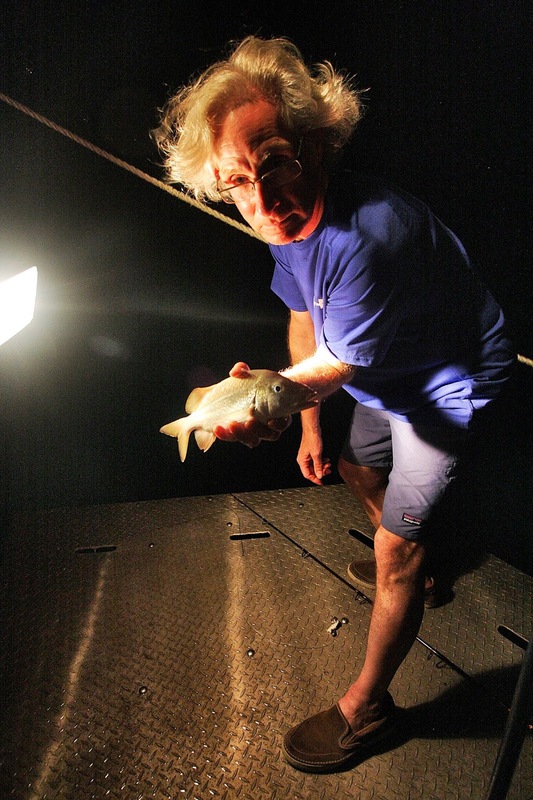 Of course, the fish ate and was soon caught and released. For the next 45 minutes, I saw and caught 4 more big bones. 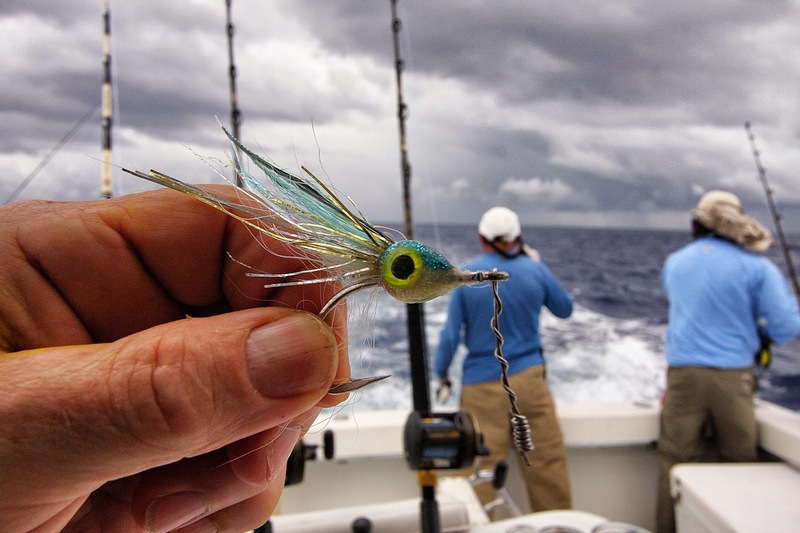 They all motored slowly past me and were eager to scarf up my pink conch fritter fly. None of these fish were less than five lbs., the biggest was probably seven. After I reached the end of the bay, I turned north to follow another bay. I could see my companions 100 yards off shore and obviously into fish. With the relaxed attitude only success brings, I searched for another spot to try. To the north, I could see a small creek dancing in the sun over a small slice of land that cut way back paralleling the bay I had waded. Slugging it out thru the soft mangrove marsh that separated the bay from the creek, I waded out into the shallow water forced to climb up and over many soft hummocks. In the process of getting to an appropriate depth, I made a huge racket. 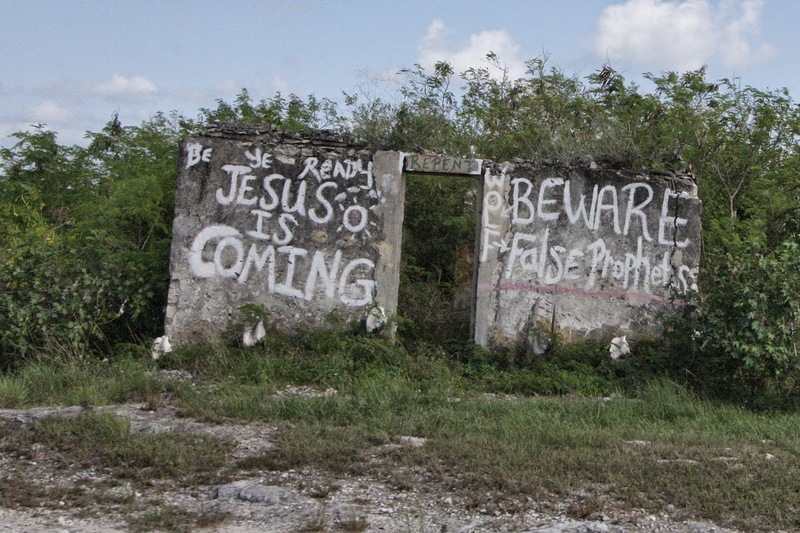 Soon I had to stop… this was ridiculous! I had hoped the bottom would firm up once away from shore. But no such luck, so I climbed indelicately up and onto a big white hummock almost falling in the process. I took a deep breath. I was sure I had scared away any bones in the neighborhood and it would take some patience on my part to wait until a few new recruits filtered back in. But within five seconds of me gaining my perch, I heard a commotion behind me. I turned around to see two big bones weaving up and over a hummock and in and out of the marl they had stirred up. They were totally engrossed in their efforts somehow oblivious to all the noise I had made. "You gotta be kidding me…". I mumbled to myself, then added "I must have sounded like a bull in a china shop!" With my feet pinned in the muck, I launched a short twenty foot cast over my shoulder. The biggest bone charged and I was hooked up almost before I had time to catch my breath. I did this three more times before exhausted from wading in this quicksand, I abandoned the flat. Fish or no fish, I wanted out. For something to do, I waded out to join Kenny and Jim. They were in a slightly deeper channel that pierced the flat. From where I stood, I could see many small bones streaming past me in large schools. I didn't cast to these schools, it just seemed anticlimactic after what I had just experienced. I watched Kenny and Jim coming towards me, then we all waded back in the direction I had come. 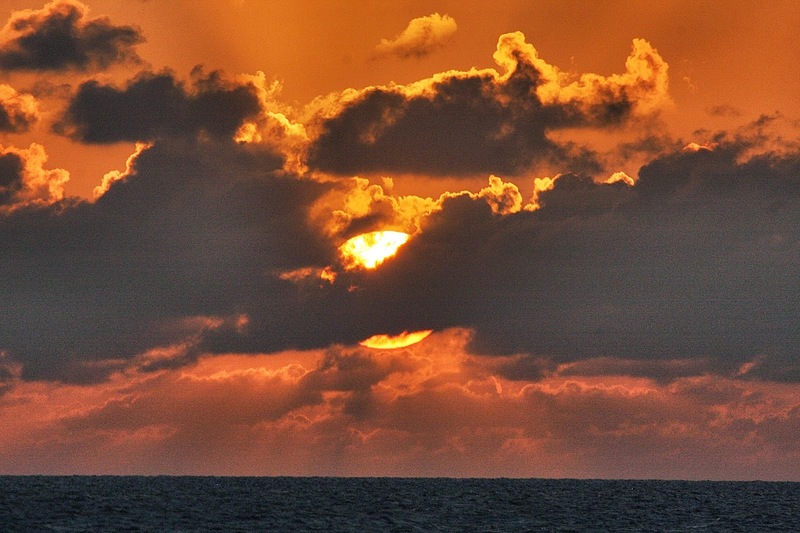 Soon, a big cloud engulfed the sun. I switched my focus to the water's surface until my attention was pulled to a tiny blip that scattered a few drops of water. I thought it was the very tip of a bigger bone's tail. If so, it was moving fast. I tossed my fly trying to calculate where the fish might be. I stripped slowly three, then four times. Suddenly my line came tight. The fish rocketed off taking me into my backing twice. "Good fish?" Kenny yelled wading closer to me. "I think so!" I shouted back knowing this had been sheer luck. 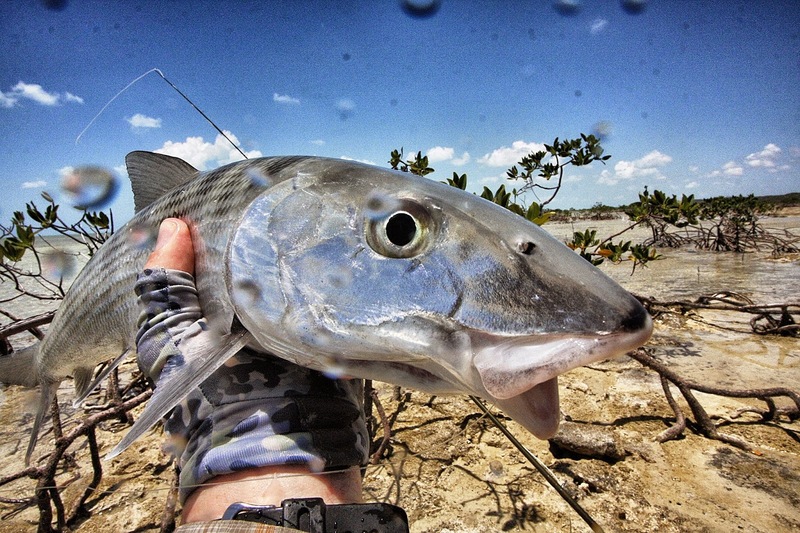 Kenny Scavella with my "even a blind pig sometime get's an acorn sometime" bonefish! Soon, I could see a 4-5 foot lemon shark tracking my fish. I cupped my spool hard and reefed the bone in. 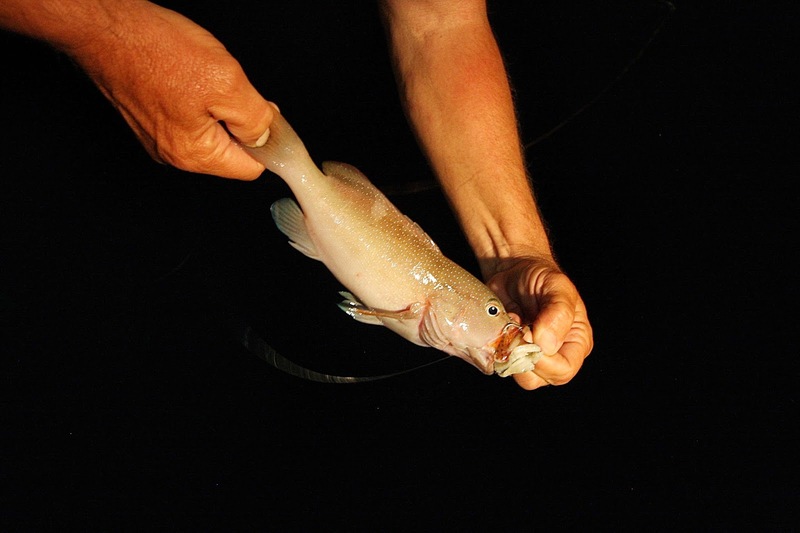 When he was alongside me, I flipped him over and nervously scooped him up and out of the water in one move. Kenny and Jim had waded over to help me, so we took a few photos then released the bone. "How big?" I asked Kenny, totally having lost all perspective. "Almost 7 pounds" Kenny said. We released the fish and I waded off the flat to relax a bit. I walked back to the point where I had first seen my companions. Jim eventually joined me. "The shark got your fish" Jim said. 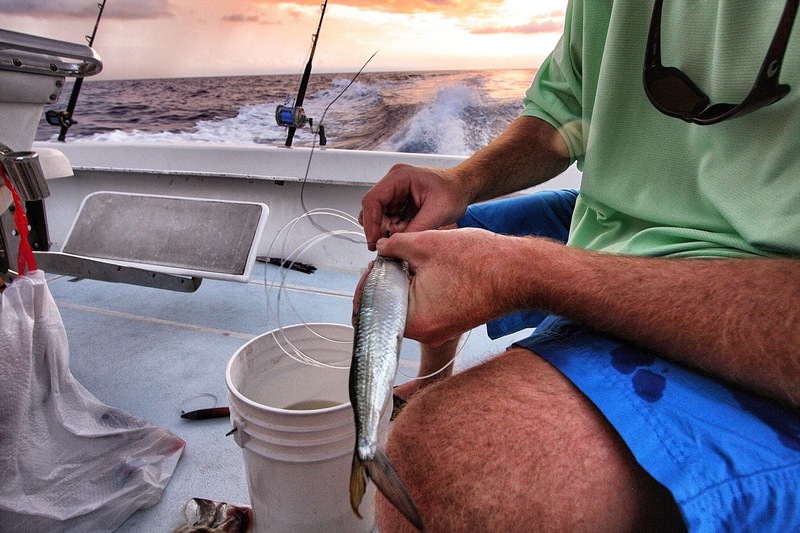 Sure enough, when I got in the skiff, there was the front half a bonefish on the bottom of the skiff. Sad for such a good fish to be eaten, but it was a great day! 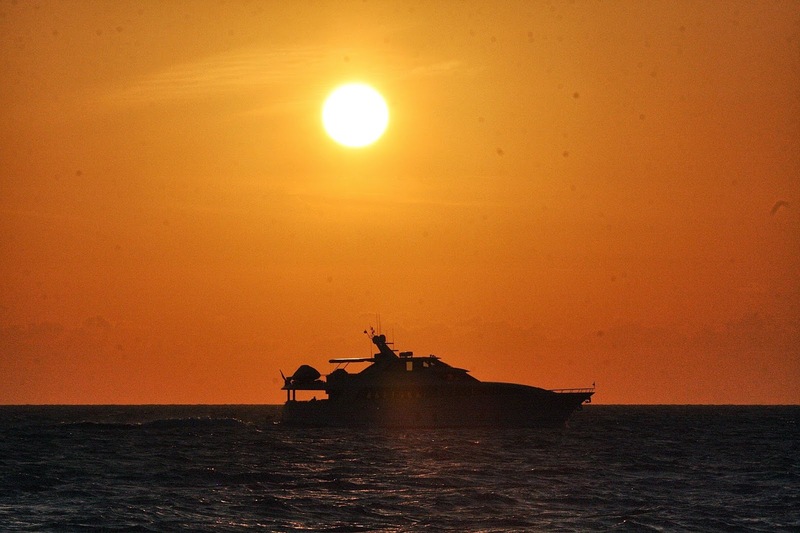 What a day, soon we were heading back to the Sea Hunter for snapper fingers, tuna steaks and a made to order sunset! On Wednesday, the wind swung another 45 degrees to the east. This small change made a dramatic difference. Instead of the breeze being offshore on the southwest shore of Crooked Island, now the wind's fetch included almost the entire Bight of Acklins. 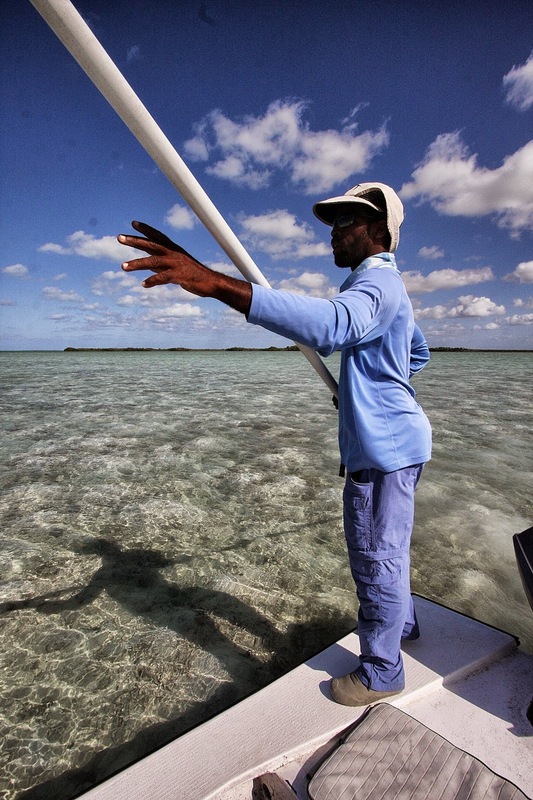 With the wind and waves going unimpeded from Acklins Island all the way to Long Cay just south of Crooked Island, the chop was strong and unrelenting. As a result, the flats were stirred up and a bit chalky. The bones were very difficult to see and virtually impossible to track once spotted. 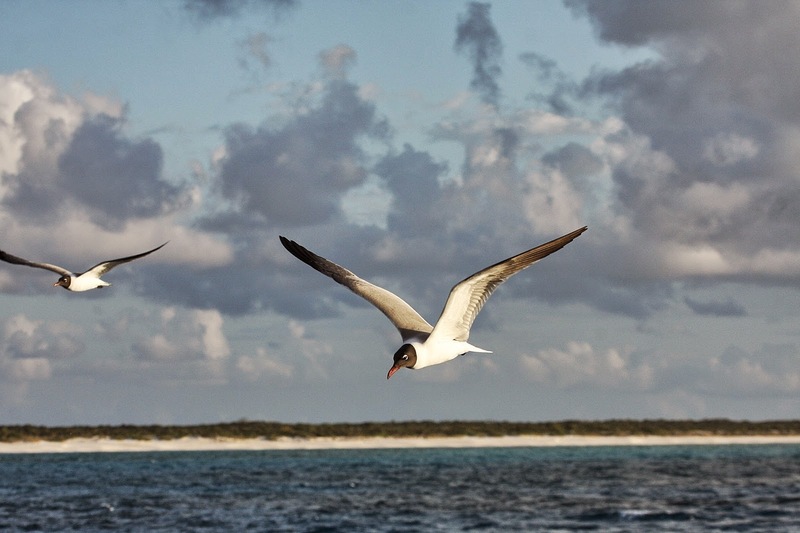 After a very tough day with only a few bones hooked, we decided to pull anchor and run to the southern tip of Acklins Island where the easterly winds wouldn't have a chance to roil the flats. 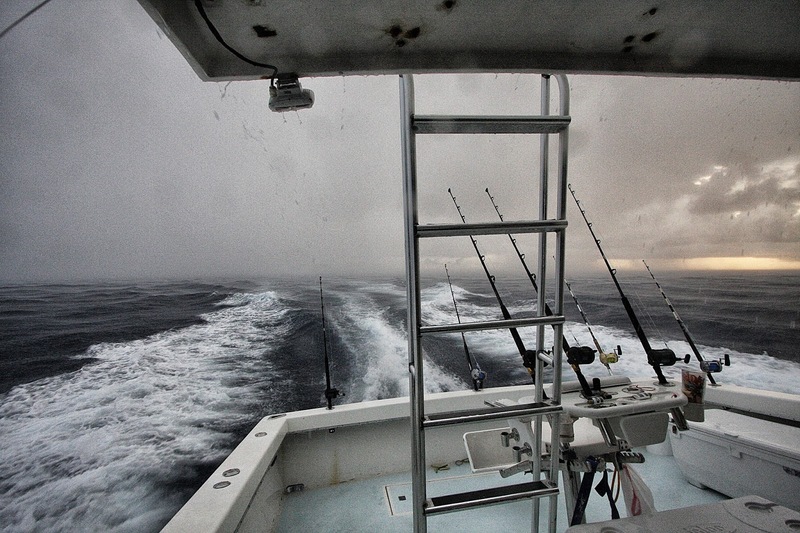 It took the Sea Hunter a little under four hours, but tomorrow promised to be a much better day. And it was! I was awakened by a series of short hard raps. “Scott, it's 4:45” Mike called from the other side of my cabin's door, "You get the other guys up, OK?" I threw my legs out into the dark searching with my toes for the bunk below. I swiped at the wall eventually finding the light switch and grabbed my toothbrush. Once in the hallway, I mimicked Mike rapping loudly on each guy’s door. Everyone it seemed was already awake. Soon we were all on deck grabbing mugs of hot coffee, hot blueberry muffins and our gear bags before heading to the port railing. Here we could see the Sweet Jessie was being prepped by the crew. 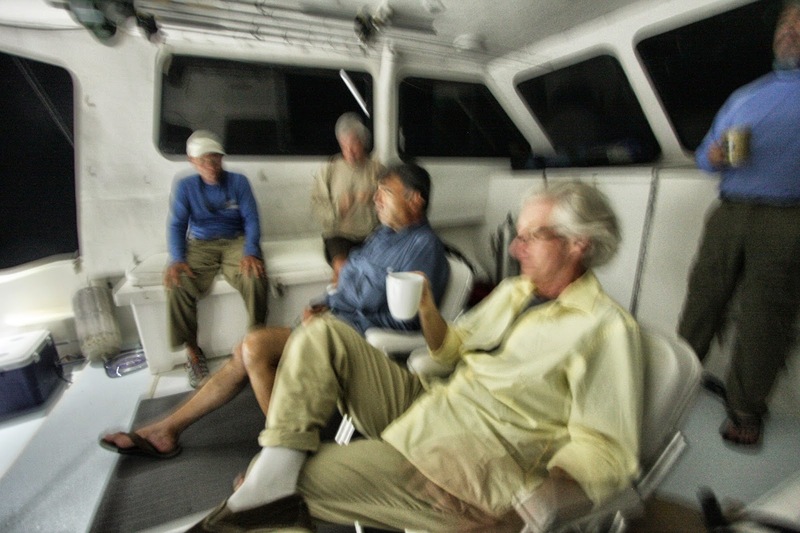 In the rich, inky darkness of a night on the ocean, we pulled away from the Sea Hunter at our appointed hour... 5:30 AM. 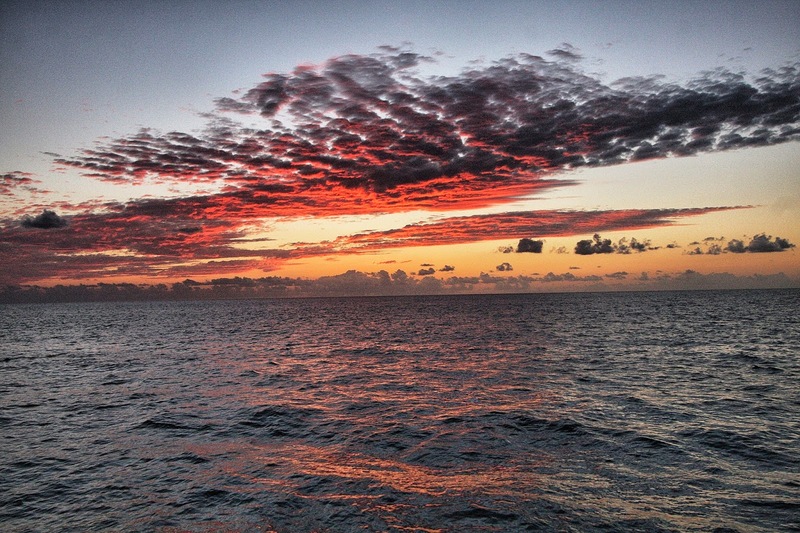 The first blush of dawn soon followed, but by then, the Sea Hunter was only a small prick of light on the horizon. 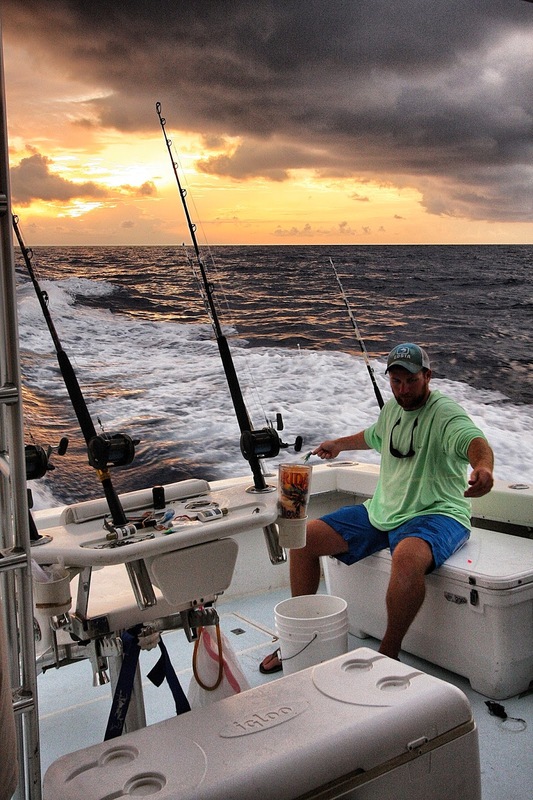 By 7:30, we were trolling two outriggers and four big rods straight back. At the helm, David Cunningham navigated the Diana Banks reading GPS coordinates so as to circle the bank and not go directly over the top. To do so meant almost certain and continual hookups with 'cudas. 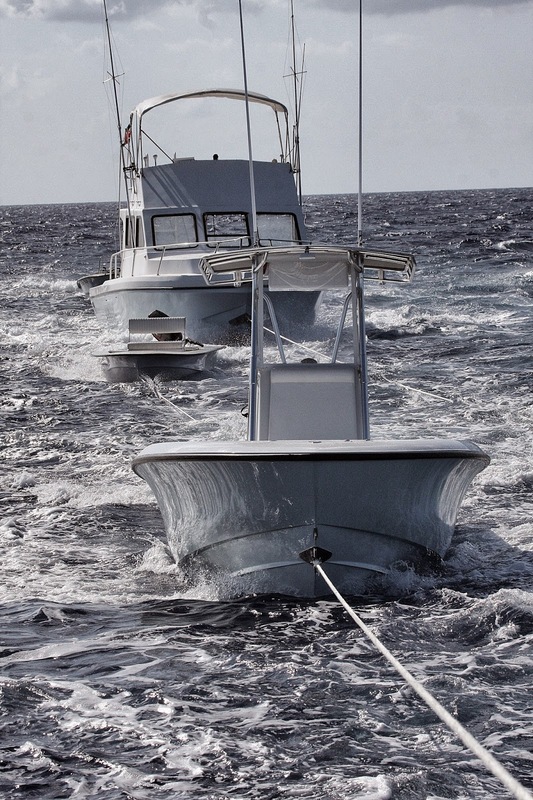 We were not on the Diana Banks for ‘cudas. 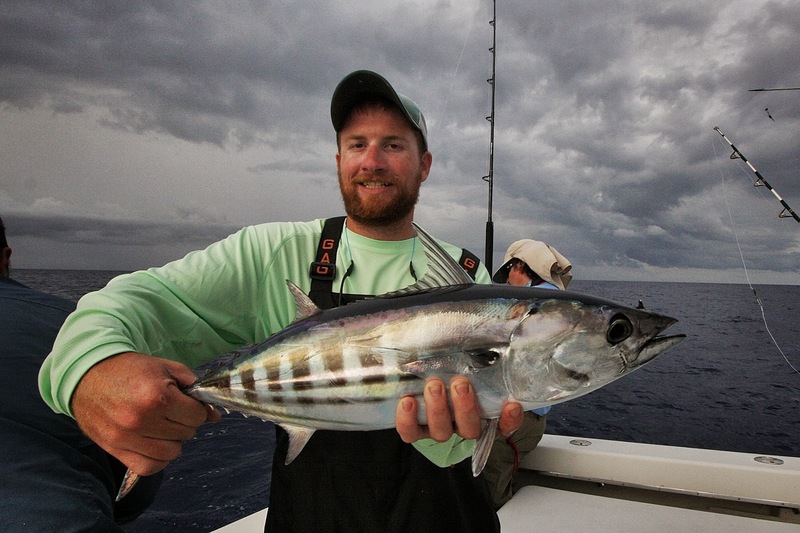 With the ballyhoo and lures in a staggered spread behind us, David announced, “We’re gonna get wet!”. 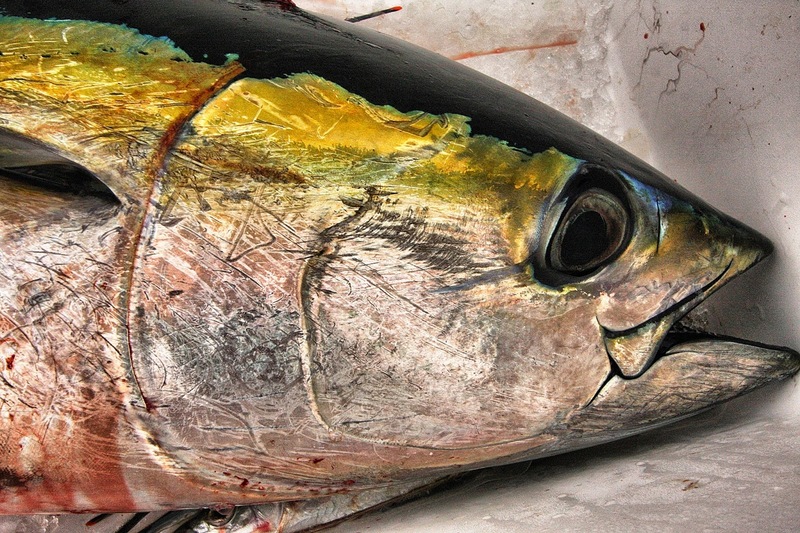 After a short fight, a beautiful skipjack was hauled on board. 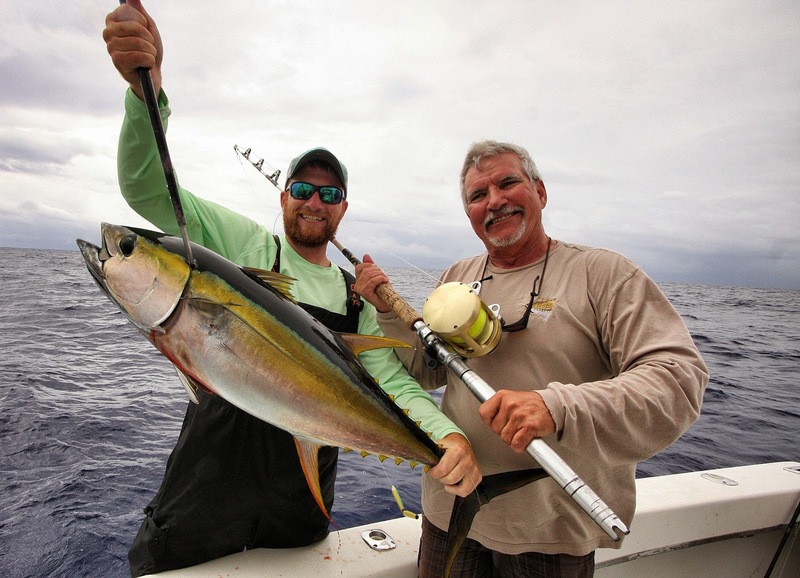 I immediately grabbed my fly rod hoping to get a cast into some blitzing tuna. I saw none, so I drifted my fly astern in the prop wash. 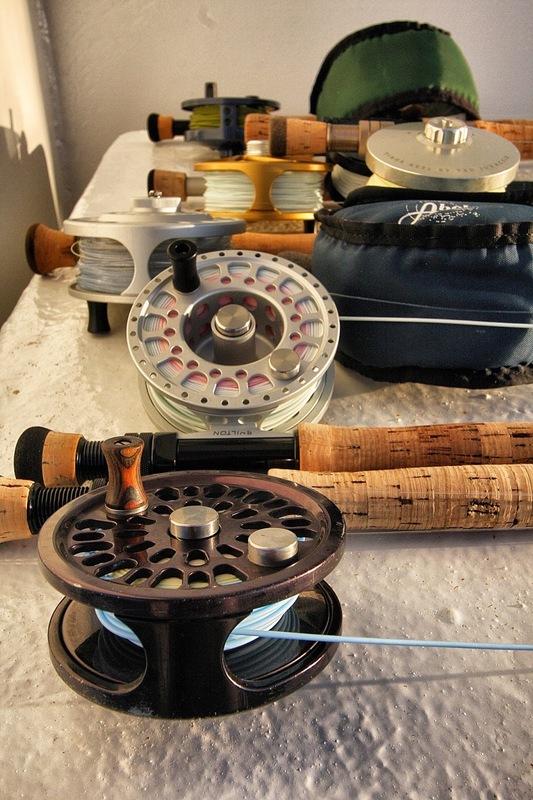 I was certainly not fly fishing, but the 12 wt. 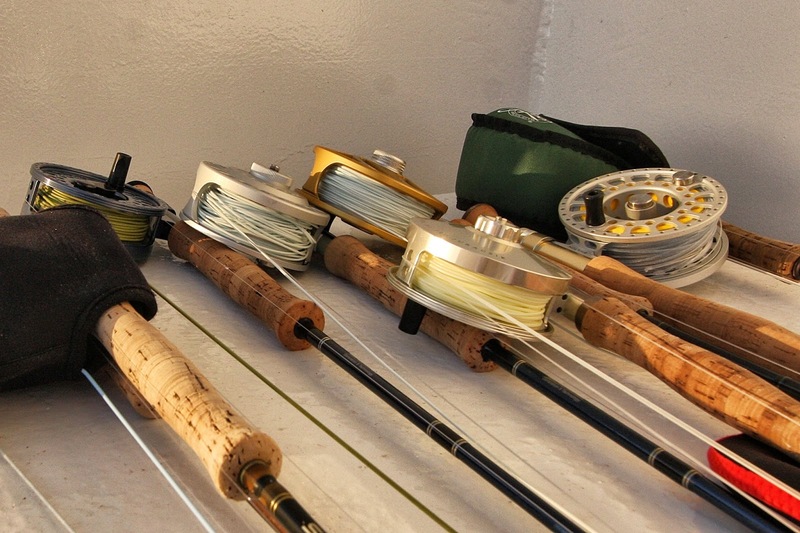 fly rod felt good and I was sure it would offer a lot more fun than one of the big trolling rods. 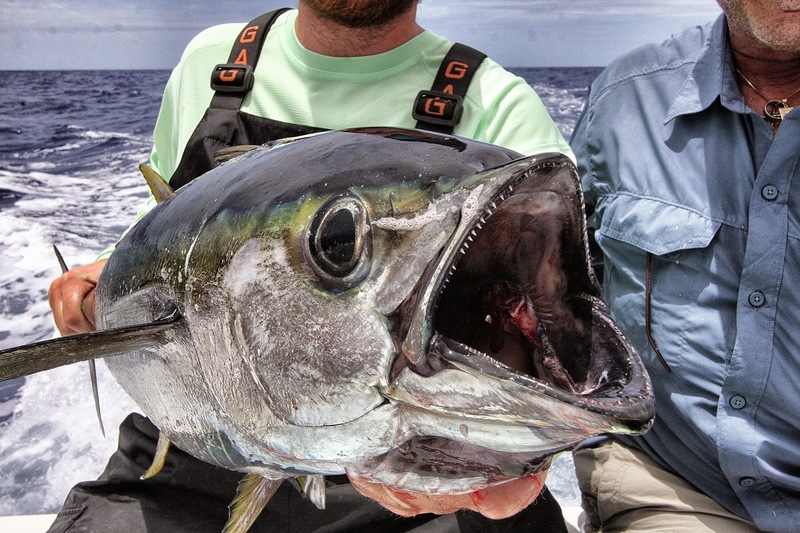 It wasn’t long before my blue/green Rainey’s Sardina fly was tight to something. 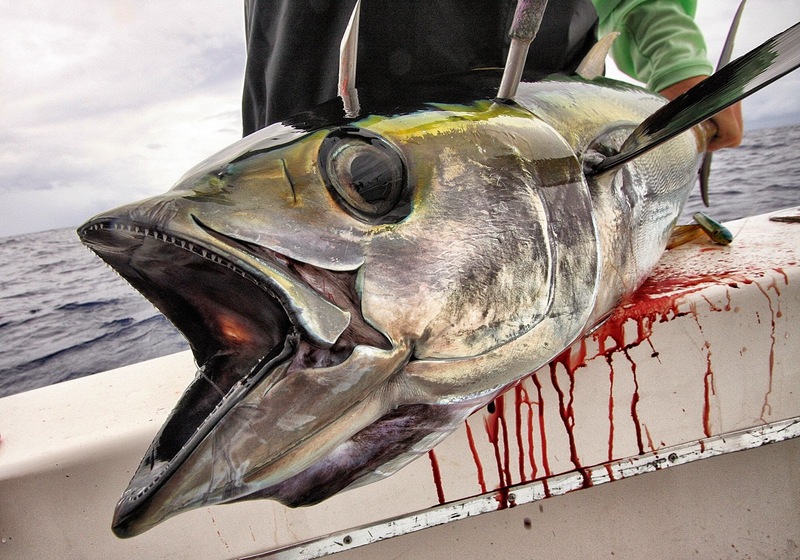 It turned out to be another hefty skipjack. It was great fun and hopefully a harbinger of good things to come. 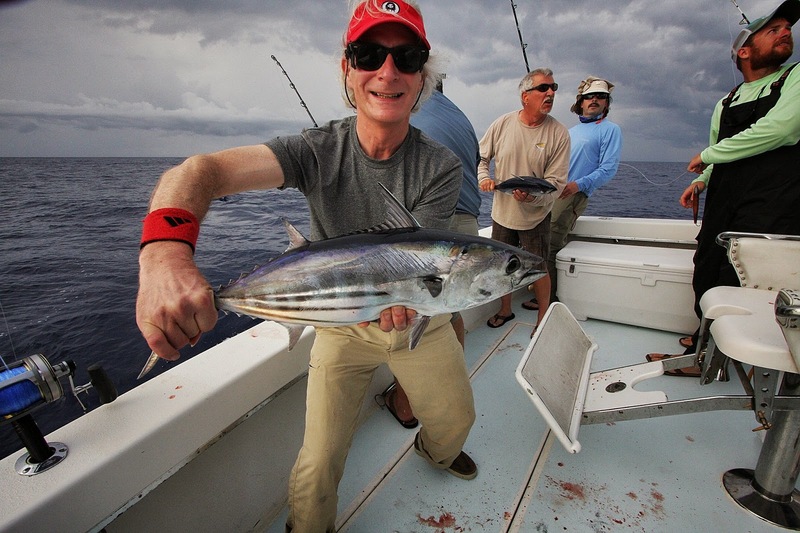 Unfortunately, we never did get to throw a fly to blitzing tuna. 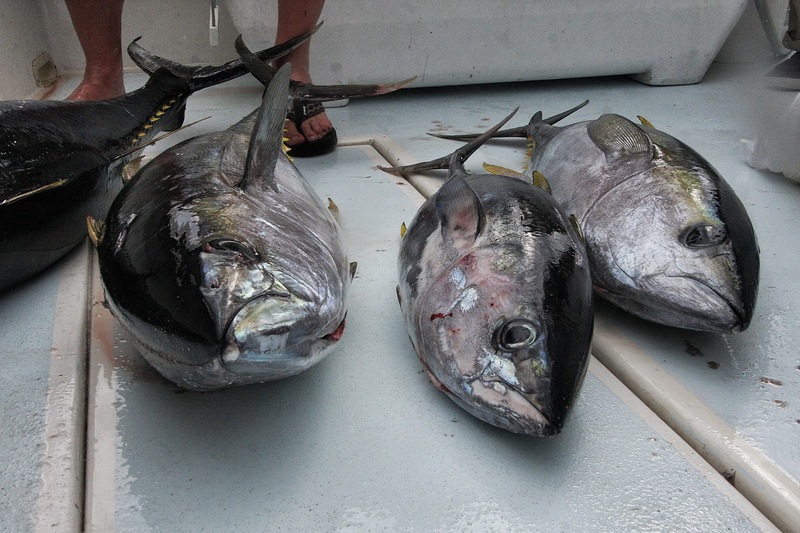 The tuna we saw were just too spread out, but all of us did manage to catch a on our fly rods a bunch of good sized skipjacks and probably were attached to a number of big yellowfin tuna too. 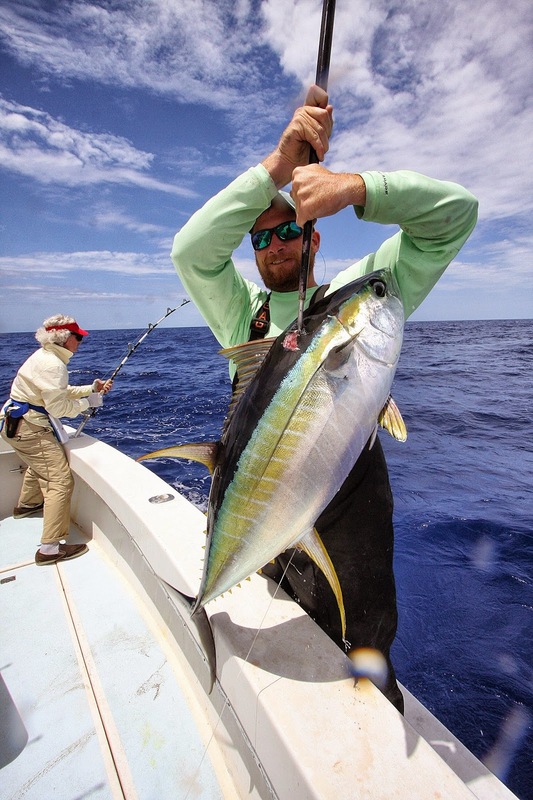 We couldn’t keep the yellowfin buttoned up on the fly gear. We did manage a 60, 52, 50, and 45 lb. 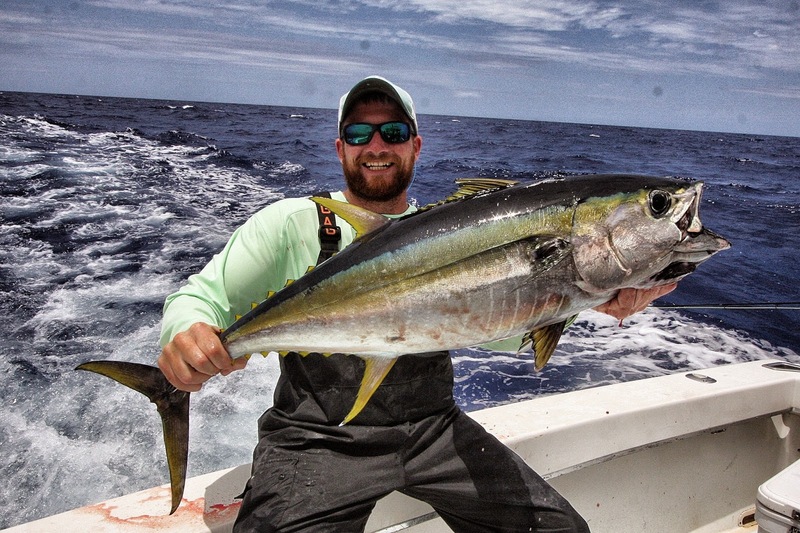 yellowfin on conventional tackle. It was a thrilling day. 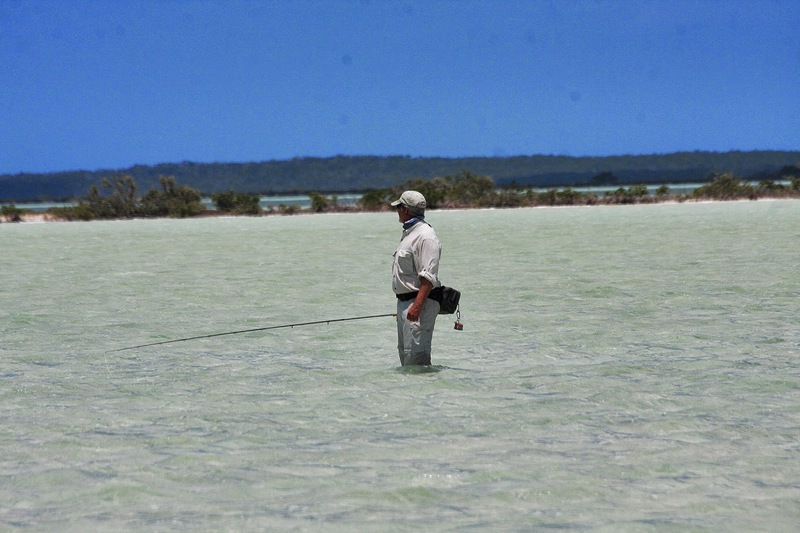 We had lots of terrific action followed by the usual slow period when all eyes are searching for birds diving on bait. Doug Jeffries and Andrew Perryman with dinner! 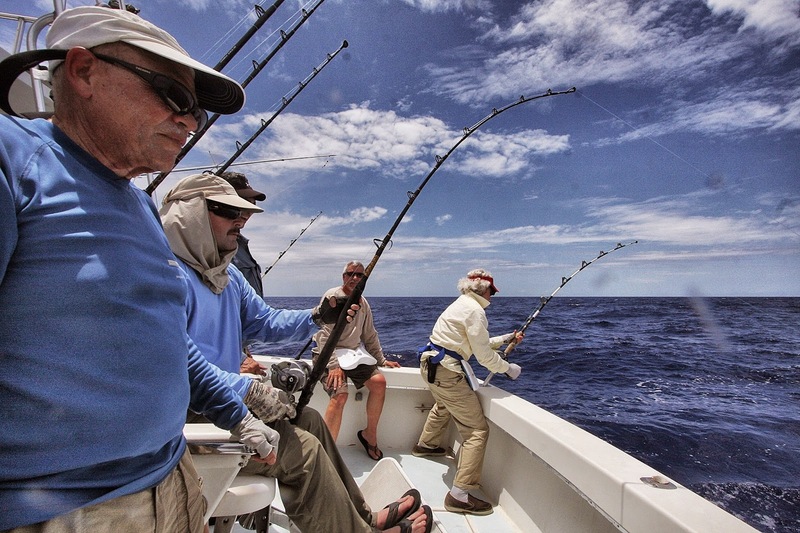 With sweaty brows and aching fingers, eventually no one wanted to reel in another big tuna, so we turned for home and French Wells. 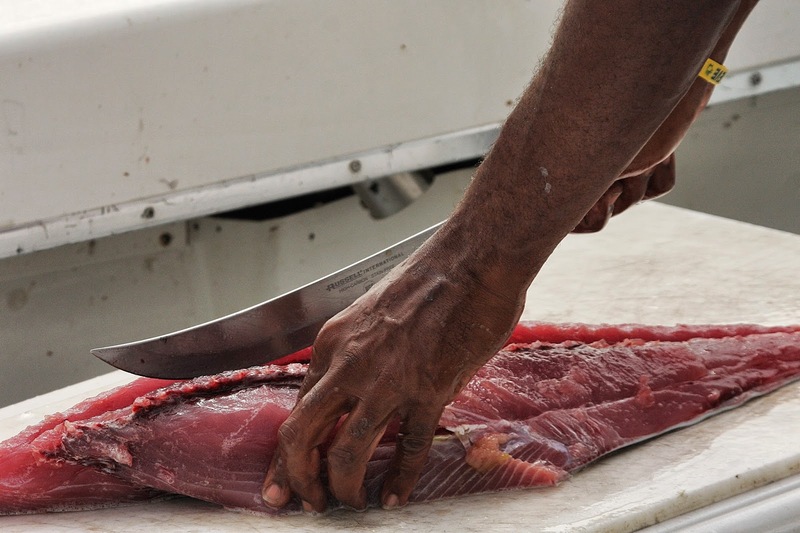 Tomorrow we would fish for bones. 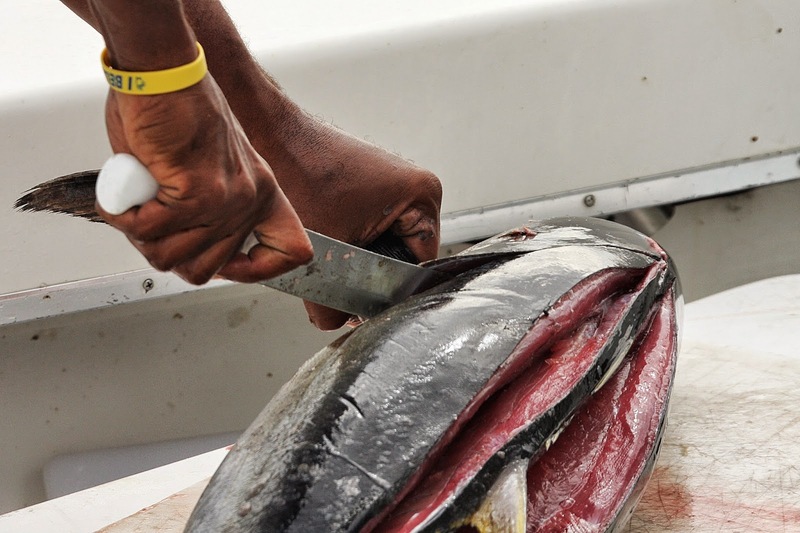 Tonight we would gorge on yellowfin sushi and tuna steaks.